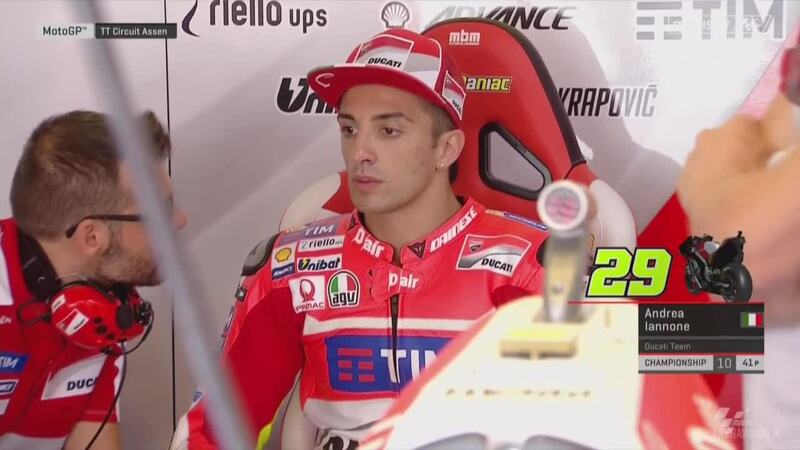 Clouds loomed overhead but no signs of rain during MotoGP™ FP2, Iannone showing no signs of slowing down again. Rain held off for Free Practice 2 at the Motul TT Assen for the premier class, the track’s condition continuing to improve after an afternoon of sun. 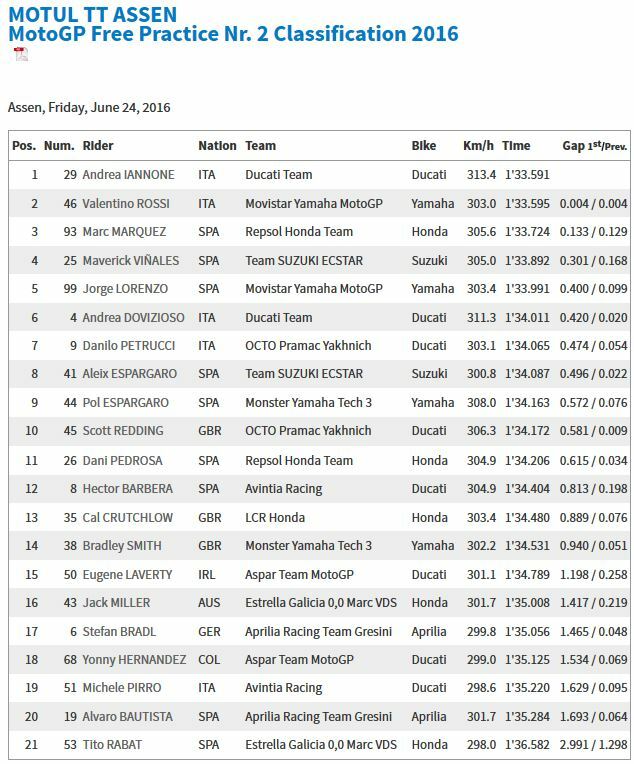 Top times had been in the mid 1’34s during Free Practice 1, Marc Marquez (Repsol Honda Team) the first rider to drop into the 1’33s early in the second session. 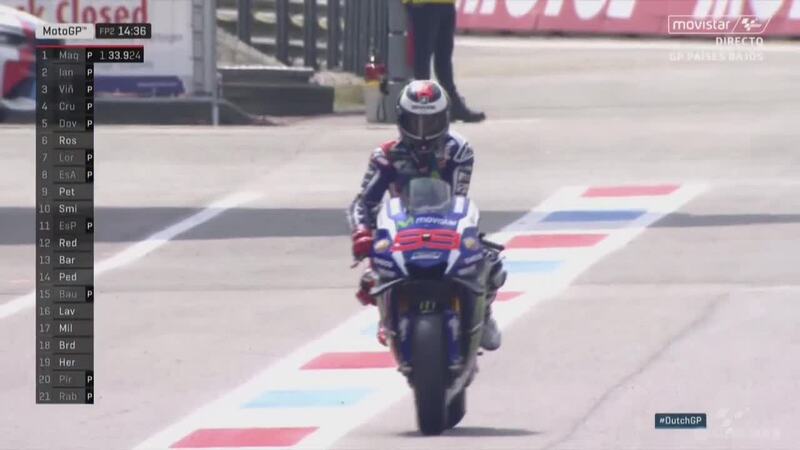 Several riders arrived in Assen with new parts, both the Movistar Yamaha MotoGP riders running a new frame on one of their bikes while Cal Crutchlow (LCR Honda) used a larger set of wings on his Honda, Marquez also using them later in the session. With rain predicted for Saturday morning, many riders pushed for a fast final lap and added even more excitement to the session. 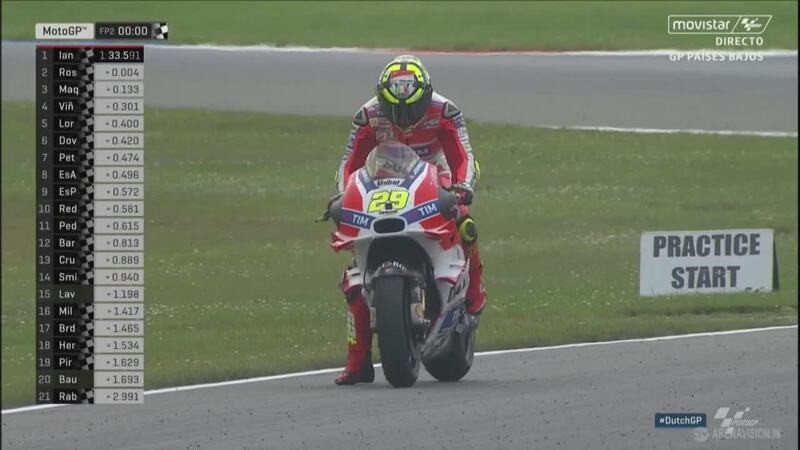 Just as he did in FP1, Iannone flew around the 4.5km TT Circuit Assen to set a fastest time of 1’33.591, 0.8s quicker than he was in the morning session. Due to his penalty in Barcelona the Italian will have to start from last, but if he can keep his pace up a top finish isn’t out of the question. 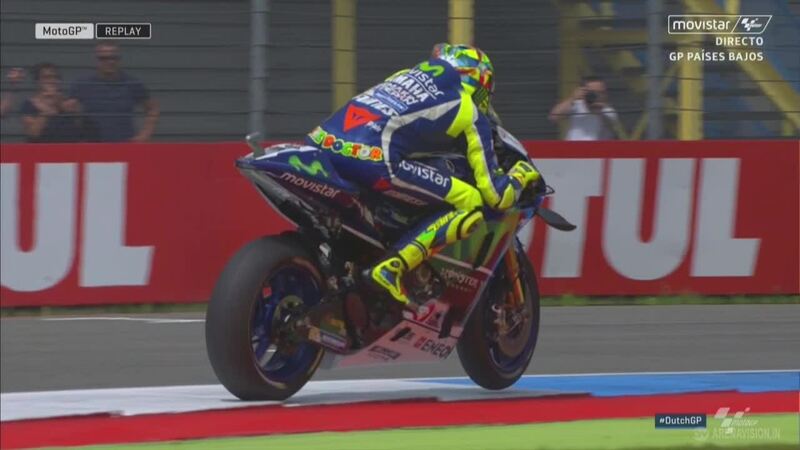 Valentino Rossi (Movistar Yamaha MotoGP) made it an all-Italian top two ending 0.004s back on his compatriot. 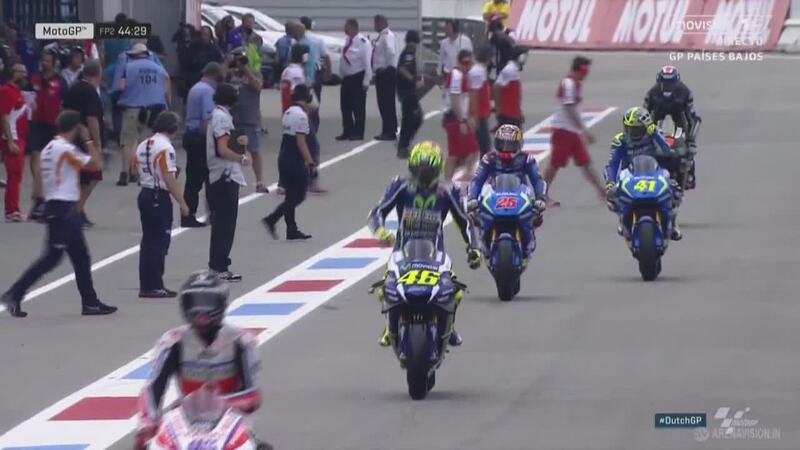 Assen is one of Rossi’s best tracks on the calendar with ‘The Doctor’ having taken seven premier class wins there, two coming since returning to Yamaha in 2013. During the press conference before the weekend Rossi highlighted the importance of finding a good direction with the Michelin tyres from the start of the weekend, a goal he has seemingly accomplished. A 1’33.724 saw Marquez complete the top three, three different manufacturers in the top three. He too made significant improvements over his pace in Free Practice 1, where he ended down in 11th place. Despite debuting several new parts during the Barcelona test, Marquez’s RC213V is almost identical to the one he raced in Barcelona, aside from the new winglets. 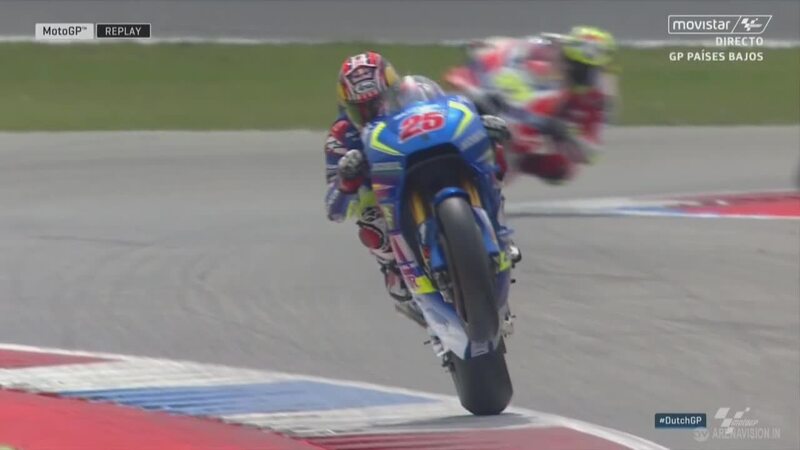 Working the Suzuki GSX-RR around Assen proved to be a physically demanding task for Maverick Viñales (Team Suzuki Ecstar), his front wheel rarely on the ground. Even so the impressive youngster set a 1’33.892 to end fourth. 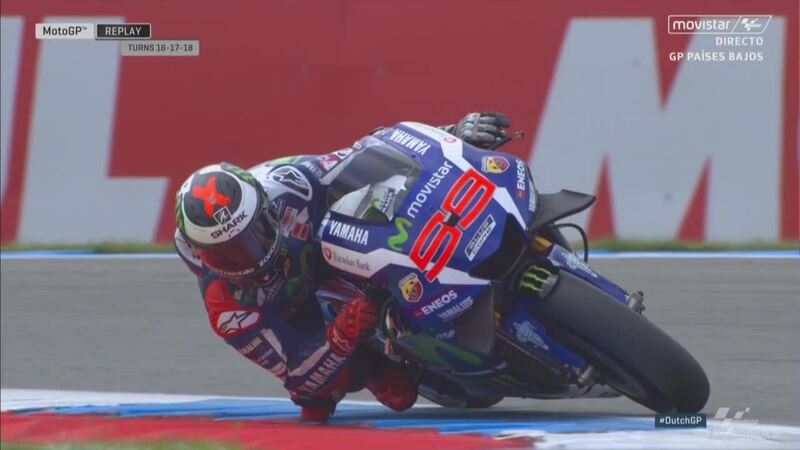 Jorge Lorenzo (Movistar Yamaha MotoGP) completed the top five and was the last rider to drop into the 1’33s. Andrea Dovizioso (Ducati Team), Danilo Petrucci (Octo Pramac Yakhnich), Aleix Espargaro (Team Suzuki Ecstar), Pol Espargaro (Monster Yamaha Tech 3) and Scott Redding (Octo Pramac Yakhnich) all gained themselves provisional access to Q2 by ending in the top ten. 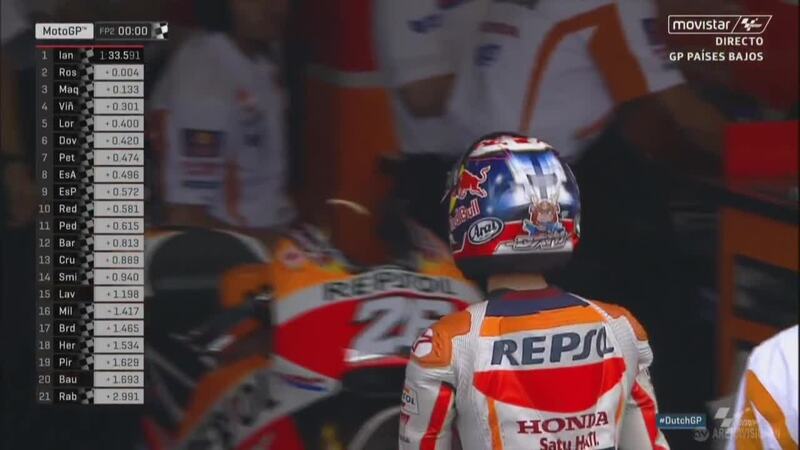 Dani Pedrosa (Repsol Honda Team) once again missed out as he finished 11th. 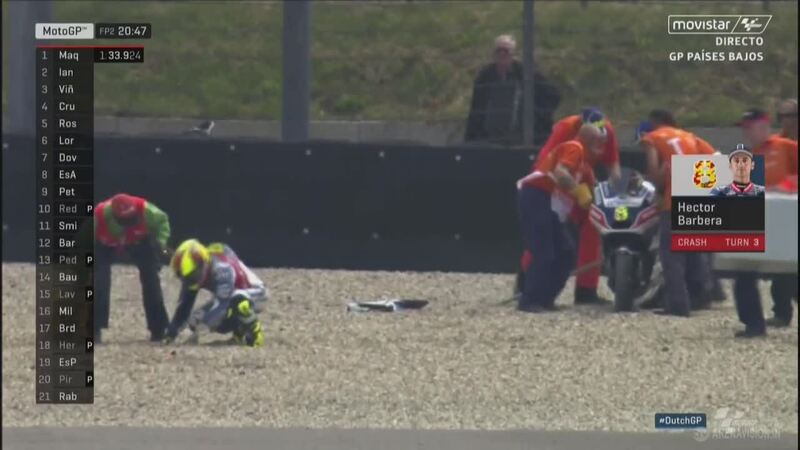 Alvaro Bautista (Aprilia Racing Team Gresini) had a fall with 37 minutes left on the clock, coming off at Turn 3. 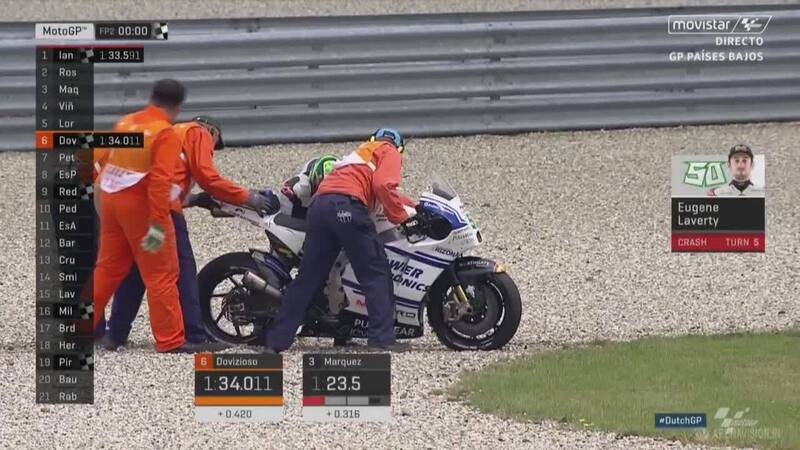 His bike took a tumble through the gravel but the Spaniard was unharmed. He has a second crash at Turn 5 late in the session. 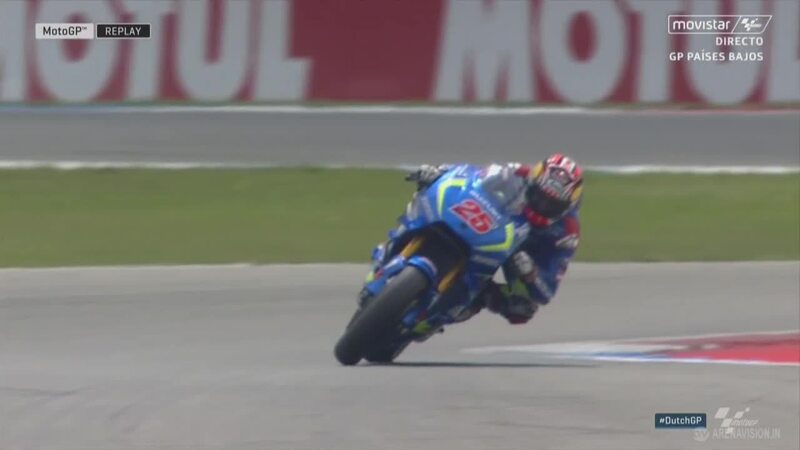 Turn 3 also saw Hector Barbera (Avintia Racing) lose the front, the Spaniard slow to his feet but able to walk away.